^ Min a Min (front) growing smaller than Sweet Privacy TM Murraya (behind). The Sweet Privacy TM plant is low maintenance but also large enough to make a great screen. 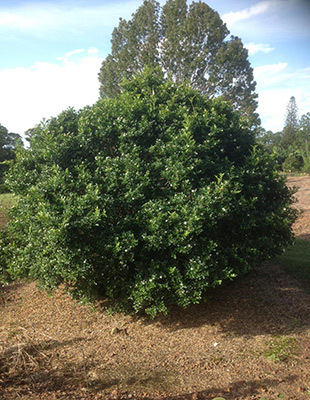 Description: Sweet Privacy™ Murraya needs less pruning than the common form (only 2-3 times a year). 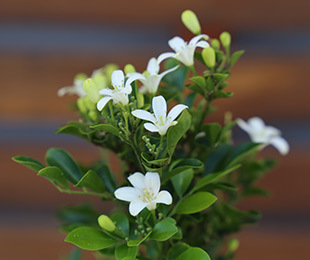 Makes a good fence high or head high screen with the added benefit of sweet smelling, beautiful white flowers in spring, late summer and early autumn. Size: 1.8-2.5m high x 1.5m wide. 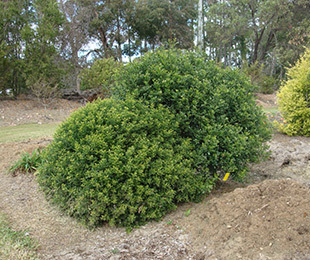 Uses: Screening, hedging or as a specimen shrub. Position: Full sun to part shade. Works with most soil types. Care: Water as required for 8-13 weeks until established. Plant in a well mulched garden (chunky mulch is recommended). Fertilise yearly with slow release fertiliser. Prune twice per year, or three times a year for very tight hedging. Where it works: QLD, NSW, NT, VIC, SA & WA.